Because of its long, exposed coastline, New Zealand is vulnerable to destructive waves that periodically surge onto its shores. Since the catastrophic Indian Ocean tsunami of 2004 and east Japan tsunami of 2011, there has been a sharpened awareness of the dangers. A tsunami is a series of broad waves in the sea (and sometimes in a lake). The cause is a movement on the sea floor – from an earthquake, a volcano erupting, or a landslide. Spreading like ripples from a stone thrown into a pond, they move outwards, travelling as fast as a jet aircraft. When they reach shallow water the waves slow down, but they become higher, sometimes 20 metres or more. They can be like a wall of water that crashes, or fast-rising water levels. They rush far inland for many minutes, moving faster than you can run. People caught by the waves often drown, or are killed by debris, and buildings are destroyed. Tsunamis can occur in any ocean. But most of them happen in the Pacific Ocean, triggered by the earthquakes and volcanoes there. Tsunamis over a metre high reach New Zealand about 12 times every century. In the 15th century, tsunamis may have forced many Māori to move inland from the coast. A massive wave wiped out an entire village on D’Urville Island. In 1855, after a powerful earthquake, water in Wellington Harbour spilled on to Lambton Quay as the land moved and the harbour tilted. 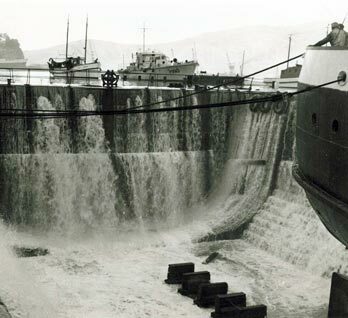 Large tsunami waves also rushed in from Cook Strait, at times leaving ships grounded on the harbour bottom. A local earthquake at Gisborne in 1947 caused a tsunami 30 minutes later. A 10-metre wave smashed a cottage, but no-one was killed. In 1960, a powerful earthquake caused a tsunami that killed thousands of people in Chile and across the Pacific. Boats, houses, and animals were lost as waves hit New Zealand's east coast. A few days later, coastal schools were closed and thousands of people moved inland when a tsunami was feared after a major aftershock of the earthquake. A magnitude 7.8 earthquake near Kaikōura in 2016 caused minor tsunami along the east coast of New Zealand. The largest onshore waves, 6-7 metres, were recorded at Goose Bay, south of Kaikōura. It could take 12 to 15 hours for a wave from a South American earthquake to arrive in New Zealand. The Pacific Tsunami Warning Center in Hawaii tells New Zealand if a tsunami is expected. Radio, television and internet announcements, phone text messages, and sirens warn people to move away from the coast. If an earthquake near New Zealand triggers a tsunami, there may not be time for an official warning or sirens. If you are on the coast during an earthquake that is strong or lasts longer than a minute, hear unusual noises from the sea or see water rising or receding from the shore, move immediately to the nearest high ground or as far inland as possible.